Update: Auburn won. 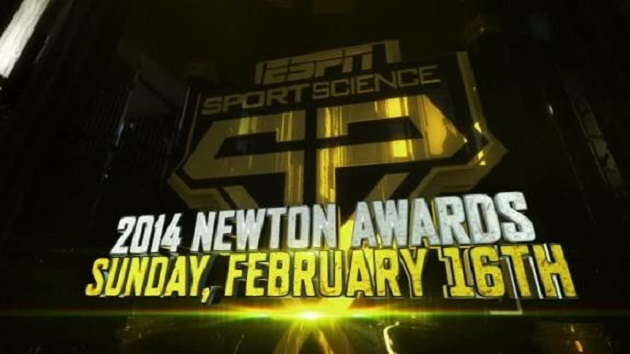 You can watch them win it on ESPN on Sunday, Feb. 16, at 5 p.m. or on ABC on Saturday, Feb. 22. ESPN’s Sport Science has shown us the nerdier (and awesome) sides of Cam Newton’s power and just how the Kick 6 worked by giving us the numbers behind every move that made each play or player so spectular. Now they’re going to give out awards for the best. Down by 3 goals in the 3rd period, the Bruins rally to defeat Toronto in overtime for one of hockey’s greatest comebacks of all time. Down 1-8, the US sailers make a historic comeback by taking 8 straight races to win the America’s Cup over New Zealand, 9-8. After he steals back his own stolen in-bounds pass, Edney hits an insane 49-foot game winning buzzer beater from past half court. Capping an incredible comeback season, led by Coach Gus Malzahn, Auburn returns a game-winning walk off field goal against Alabama with a 109-yard miracle. One of the greatest Cinderella stories in NCAA basketball history, Florida Gulf Coast knocks off 2 seed Georgetown to become the first ever 15 seed to reach the Sweet 16. I think both plays should win every award, but I’ll take it. And I don’t want to spoil anything for you, but I do know the Malzahns will at least be in attendance. With the ceremony being in Los Angeles, I wouldn’t expect them to fly out for nothing. As far as the ESPYs, though, Auburn really should be nominated for four or five awards. We’ll see.